Notes: Lucy uses the name "Sassafrassa" in the dream sequence; this is actually the name she gave an imaginary friend when she was a child in Celeron, New York. Notes: Ann Sothern is written into the show to fill in for Vivian when she is not on the show. Notes: The blockboster film, My Fair Lady (1964) had just been released and many sitcoms were doing parodies of the screen musical. Notes: Arthur Godfrey had been a huge television star in the 1950s, but by this time was semi-retired. Notes: This is the last episode where Lucy, Viv, and Mr. Mooney all have a chance to be funny together. Notes: This is the last aired episode for the current format. Vivian has decided to leave the show unless she gets more creative control. It is decided not to meet Vivian's demands, and Vance leaves the series. This is a decision Lucille will regret for the rest of her life. Without Vivian aboard, Lucy truly toys with the idea of ending the program. 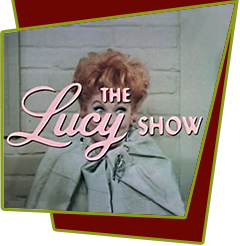 Notes: A new opening, featuring a kaleidoscope of The Lucy Show scenes from previous seasons, is used this year. Notes: This episode establishes Lucy's new apartment in Hollywood, and life without her children. Mary Jane Croft is once again a regular cast member. Notes: This is the first of the "Iron Man Carmichael" episodes. Notes: Bill Frawley does his cameo appearance in this episode as the track maintenance man. This is his final appearance with Lucille Ball in her shows before his death the following Spring, 1966. Notes: In a few weeks, Lucy not only works for Mooney full time, but it appears as if they have always been boss and employee. Notes: This is the last appearance by Jimmy Garrett as Jerry Carmichael. In fact daughter Chris is not even mentioned anymore. Without Vivian or the kids as the story line participants, Lucy Carmichael relies weekly on guest stars to keep her from always appearing in the Mr. Mooney plot lines. Notes: Young Wayne Newton, although already a known entity as a fast rising singer of pop songs, is literally catapulted into stardom by this appearance. Notes: The two "modern" braves are played by future M*A*S*H* (1972-83) performers Jamie Farr and Alan Reed Jr.